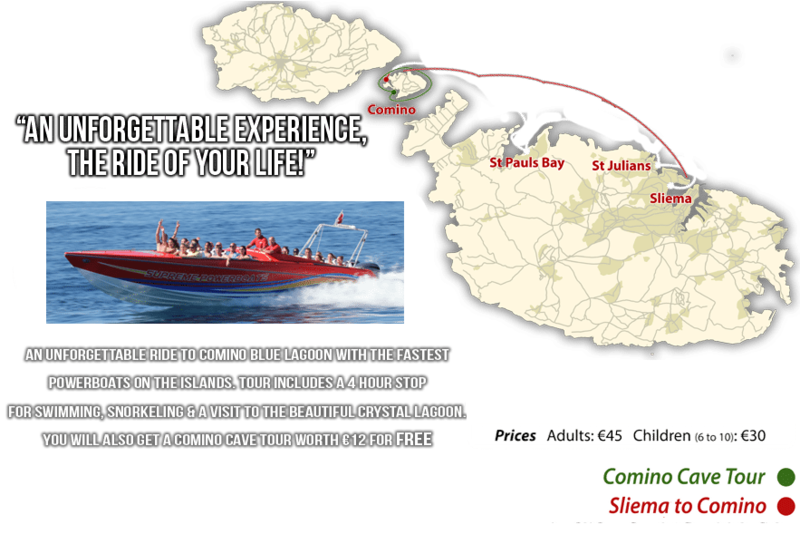 The fastest boat ride on the Maltese islands! We have three Chaudron Power Boats all equipped with twin yamaha 300hp engines. Tour includes a 4 hour stop for swimming, snorkeling and a visit to the beautiful Crystal Lagoon. You will also get a Comino Cave Tour worth Eur 15 for FREE. Our Boats are custom built. They are 33 feet long with twin yamaha 300hp engines and hold over 20 people. Constructed by the famous Chaudron boat company, a company established in Malta in 1988 which today is the undisputed top boat-building company in Malta. Chaudron started competing in the PowerBoat P1 championship in 2004 with the debut race in home seas. Chaudron were allowed to compete after being given a wildcard and after the experience the team planned on entering the SuperSport championship with the main aim of securing the world title – an ambition achieved in 2007 and 2008. Comino is a small island located between the larger islands of Malta and Gozo. Comino is noted for its tranquillity and isolation. It has almost no permanent residents and is now mainly visited by tourists. St Marys tower is the most visible structure on the island. Dating back to 1416 when the Maltese petitioned their King to build a tower on Comino to serve as an early warning system in case on invasion, and to deter marauding Turks, pirates, smugglers and corsairs from using Comino as a hiding place and staging ground for devastating sorties onto the sister islands Of Malta and Gozo.